I have found reference to a Mr Brady as Headmaster but without his years being specified. There are no gaps in the appointments listed below so I have recorded his name here until I can obtain clarification. Thomas Dobson BA (1814-1885) Taught navigation, maths and the use of nautical instruments. In 1863 he moved to be Head of Hexham High School. 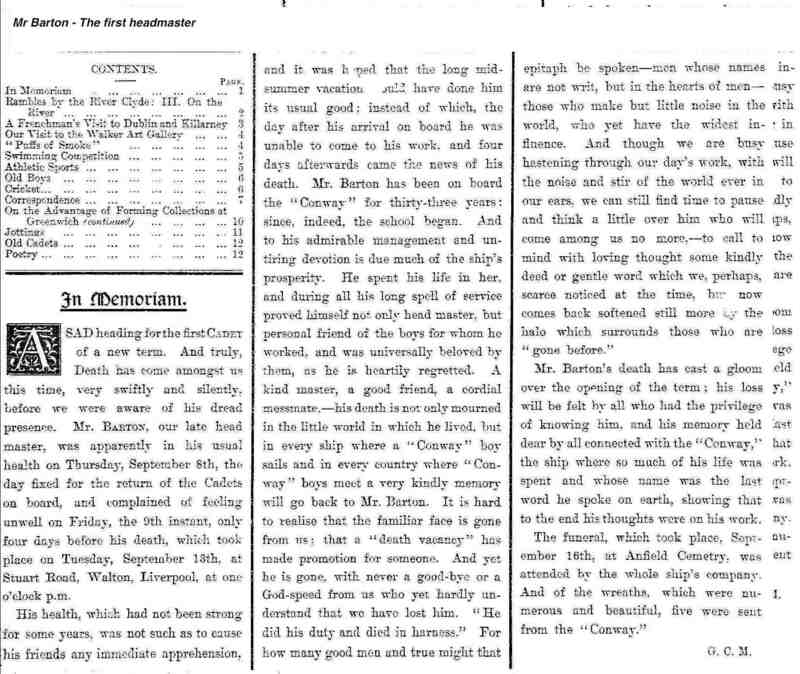 Joined as an Assistant Master in 1898 he gave 35 years service to the ship. Taught the Navy Class. (called "Spitfire" in the 1940s as he was ex RAF. More generally know as Tube because of his initials). The headmaster, he also taught Physics. Wore a gown and mortar-board. When perplexed he had the habit of scratching his stern and then vigorously rubbing his nose, saying “Most extraordinary! Most extraordinary!” Liked by everybody. He was born at 26 York Street, Heigham, Norwich, in October 1899. He was educated at the City of Norwich School, and commissioned Probationary Flight Officer, Royal Naval Air Service, in September 1917. After an initial posting to the Royal Naval College, Greenwich, Browne was posted to the Flying Training School at R.N.A.S. Chingford. He flew his first solo in a D.H.6 in February 1918, and carried out further training in 504K Avros at Fairlop. Browne was posted to Cranwell in March 1918, and after some preliminary training on B.E.’s he was posted to Scout Flight for fighter training. This did not last long, as he was subsequently posted to the Handley Page flight. After attending courses at the Bombing and Gunnery School, Eastchurch, and on Night Flying and Navigation at Stonehenge, Browne was posted as pilot for operational service with 16 (Naval) Squadron (Handley Pages), Ochey, France, in June 1918. Operating as part of Trenchard’s Independent Force in France, the Squadron was engaged on long range bombing operations over Germany until the Armistice. ‘My observer for my longest raid, on the railway yards at Frankfurt on August 21st, 1918, was a young Canadian, J W Adams.... he was a good navigator and he laid our course faultlessly on that moonlight night to take us over to the Rhine Valley and then down the faint silver ribbon of the river winding northwards to our target. To the jet pilot of today we would have looked uncomfortably primitive sitting side by side in the open cockpit hauled through the night by our two Rolls Royce engines at a mere seventy miles per hour. But for us there was more than a tinge of pride in taking the biggest aircraft then known carrying the heaviest load over the longest distance into enemy territory. For the actual bombing run Adams had to crawl through a very small opening into the front cockpit the sides of which were barely waist high, lean over the open bomb sight, and direct me over the target by waving his arms. There was during all this a considerable concentration of searchlight beams, red flashes, dull woofs, and a few unpleasantly loud cracks. At last the run was over and I could make a steep diving sideslip to take us out of the beams and the barrage as quickly as possible.... From our base to Frankfurt and back would be hardly an hour’s run for a modern jet, but we had been flying for nearly six when we picked up the light which told us we were only about fifteen miles from home.... We were only about 500 feet above the ground when there was a hesitant cough from the starboard engine and it died. I opened up the port engine to full revs and began to make a turn to get over the thick woods into the open field below, but half way through the turn that engine too spluttered to a stop.... I decided to attempt a landing on the near side of the wood where there was a limited stretch of flat ground rather than try to stretch my glide and run the risk of stalling in an attempt to reach the field on the far side. Hauling on the wheel I tilted the eighty foot wing span into a ponderous sideslip and touched down about a hundred yards from the trees. The most powerful brakes could not have stopped several tons of aeroplane in that distance. We had no brakes. I pictured the nose meeting the first large tree trunk and driving the edges of the cockpit together like the blades of a pair of shears with both of us being messily decapitated, so I shouted to Adams to get down behind the bullet proof seat. He slipped back and I followed as soon as I felt sure that we would not get airborne again. The four big wheels hit the bank at the edge of the wood, bounded up for their last brief take off, and plunged into the trees. The silence after the first splintering crashes subsided seemed almost unreal. We crept out of our refuge and saw that the nose had thrust itself up between two large trees with the cockpit still open and undamaged... a shout from Adams sent me out pretty damn quick. After the war, Browne was posted to 167 Squadron at the Long Distance Experimental Establishment at Bircham Newton. He was placed on the Unemployed List in February 1919, and returned to education studying at Bangor University. In 1922 he embarked on a career as a schoolmaster, and taught at Bourne Secondary School, Lincolnshire, Lucton School, Herefordshire and Magdalen College School, Brackley. When the Reserve of Air Force Officers was formed in 1923, he applied and was appointed Pilot Officer on probation. Browne undertook a refresher course at the De Havilland civilian flying training school at Hendon, and was confirmed as a Pilot Officer in October 1923. Browne returned to education once again, and read Chemistry at Oxford from 1928. He advanced to Flight Lieutenant in July 1930, and to Squadron Leader in November 1937. 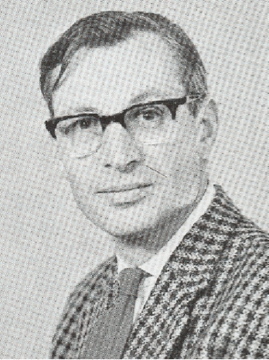 After Oxford he taught at Oakham School, until appointed Headmaster of the Cadet School Ship H.M.S. Conway at Rockferry in 1934. Browne re-engaged for service with the outbreak of the Second War, and was posted as Officer Commanding Flying at the Bombing and Gunnery School at Jurby, Isle of Man. The posting was brief, and in November 1939, he was posted as Group Liaison Officer, No. 25 (Armaments) Group, Flying Training Command. Subsequent postings included to the Specialist Navigation School in May 1941 - this being transferred from St. Athan to Canada and re-designated No. 31 Advanced Navigation School, Port Albert. 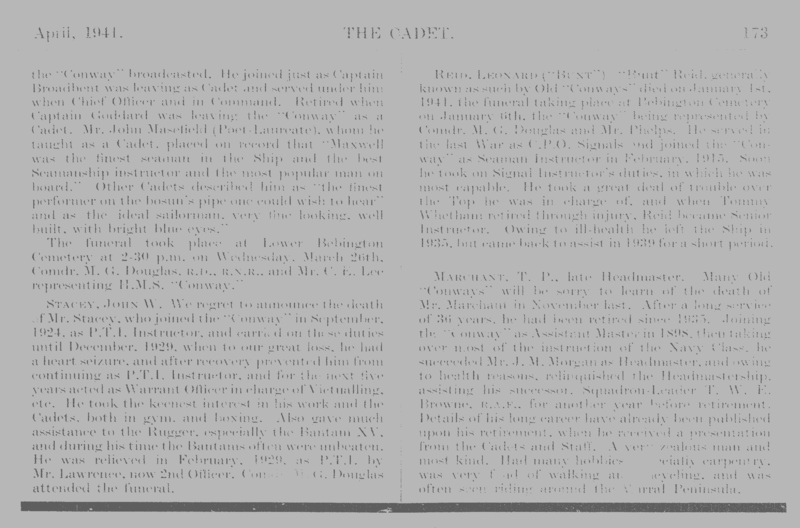 Having qualified as a Specialist Navigator, Browne was appointed staff officer in command of Navigation, No. 1 Training Command, Toronto. The latter appointment meaning a secondment to the Royal Canadian Air Force, and stay of two years in Canada. Browne advanced to Wing Commander in January 1943, and navigated his own return to the UK in a Martin Marina Flying Boat in October of the same year. He was posted as Chief Instructor, No. 6 Advanced Flying Unit, Staverton, in 1943 (awarded Air Efficiency Award in the same year). The following year Browne took up his last wartime appointment, on the staff of No. 29 Group, Dumfries, before being demobilised in June 1945. 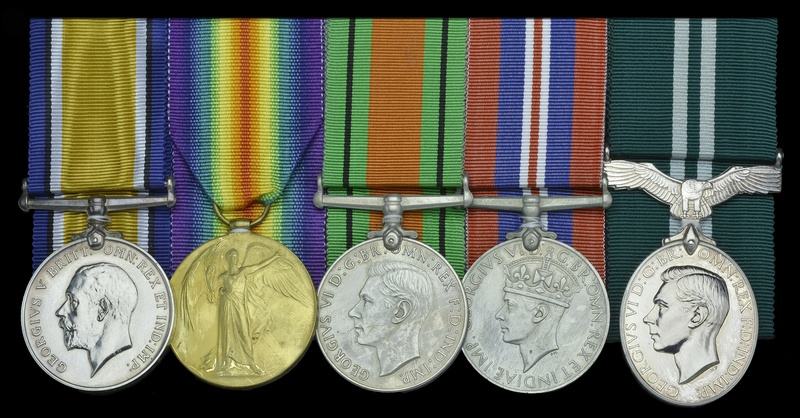 His medals from WWI and WWII are below. 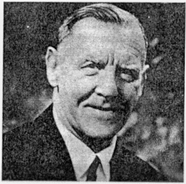 Post-war Browne returned as Headmaster of H.M.S. Conway, in which capacity he continued to be employed until his retirement in 1964. In the latter year he oversaw the opening of the new buildings by Prince Philip. His daily diaries show him to have been very forward thinking and he had firm views about how Conway training needed to be updated and to evolve. These brought him into frequent conflct with the Captain Superintendent who had less progressive views on nautical training. TEWB's inability to get these changes approved undoubtedly contributed to Conway's eventual demise as her training did not adapt to modern shipping company needs. When politcal pressures threatened Conway's future the shipping companies did not rally round her; Conway was not producing the sort of cadets they neeeded so they had started training their own boys. At the very momemt Conway most need their support they had come to not rely on Conway as the main source of recruits. Browne had seen the writing on the wall, the Captain Superintendent had not. Browne died at his home ‘Kelvin’, Old Quay Lane, Neston, Wirral, in June 1973. Basil aka Foxey aka Lordy). 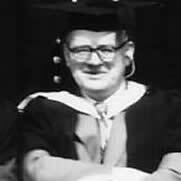 Headmaster 1964-74 Nicknames derived from a TV hand puppet of the time called Basil Brush. An Honours Boards made from the Ship's timbers listing the 9 Headmasters (Tom Browne served twice) hangs in the Conway Chapel at Birkenhead Priory, paid for from donations to the Captain Hewitt Memorial Fund.